There seems to be a general consensus that it’s okay to be unsatisfied and unhappy in our work life. Some of us wear it as a kind of a badge of honor, to go into a job we hate and to battle it out each day, martyring ourselves in hopes that it fulfills our need for feeling significant. For others, it’s an epidemic of the doldrums and a overriding dreariness that has been accepted as “normal” within the workplace. If we took a large scanner and grabbed an average sample from the domestic US, I believe we’d see extremely high levels of boredom and dissatisfaction in the workplace. Who is that truly helping? No one. Boredom, stagnancy, and routine may get the baseline level of work done, it’s true. But what company is satisfied with mediocre level work, and mediocre level profits? Dare I suggest that you shouldn’t be either, then? I recently visited a beauty salon and asked my esthetician if she liked her job. To which she replied, “It’s easy.” Let’s not get hypnotized into believing that having a job that’s “easy” or one that just “pays the bills” is good enough. ** I believe that all of us have more to contribute than what’s on our résumés. And I believe that you’re more than the 9-5. If the questions have started bubbling up from inside of you, they’re not to be dismissed. Start listening to those desires and the questions that arise from within. Those questions are the sign of life, of a life unlived. It’s been said that the quality of our lives is directly related to the types of questions we ask ourselves. What if Madonna had settled for her job at Dunkin Donuts and given up on her dance career, early on? What if it wasn’t actually “normal” to hate your job? What if it were possible to wake up more often than not, excited to be doing your work? I’m here to tell you that it is possible. Not only because I’ve experienced it, but I’ve witnessed many others who have. And once you know that it’s possible, it’s hard not to want to create it yourself. But this is not the path of the majority, and it is not the easy path. The majority has accepted the routine of mediocrity and one of drudgery. If you want to be a part of the few who are invigorated by their work instead of drained by it, it takes guts. 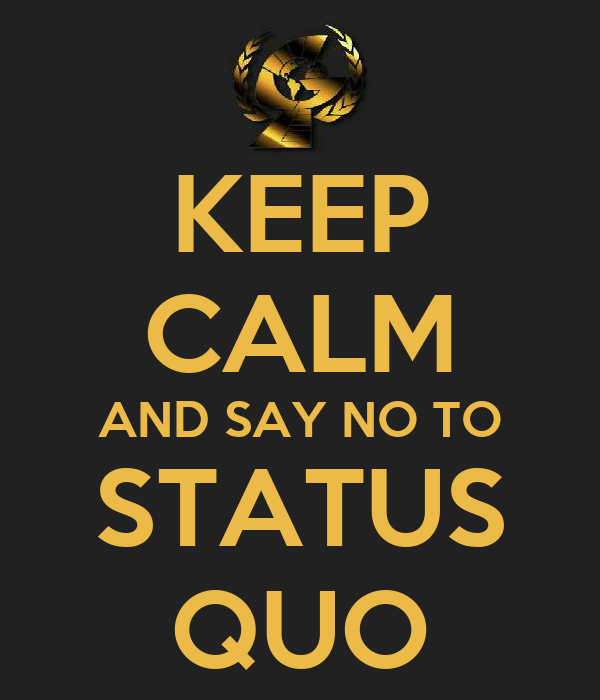 And it starts by saying No to the status quo.